Chicago from 1915 to 1929 was a major center of innovative music. Some of America's greatest musicians came out of Chicago during this time period including: Russell, Jimmy McPartland, Dave Tough, George Wettling and Benny Goodman Krupa's first introduction to music came while working as an errand boy in a local music store Many times he would go off by himself and listen to the records For a time, he played saxophone. But, it was in a dance hall that Gene had his first meeting with a drumset and it was instant love. Sensing Gene's potential, his brother went out the next week to buy him a set. At 13, Krupa first played with a band at a jam session. This debut landed him a job with the Frivolians and that summer, he played with Ben Pollack's Orchestra, Later in his life. Gene attributed those two playing assignments as having the greatest influence on his drumming career. While trying to develop proficiency on the drums or "beating the hides,'* Krupa also did a lot of listening to develop his musical background. His perseverance paid off. While playing a string of amateur clubs and private parties, the Joe Karper Orchestra hired him as their drummer. This was his first professional job. A club called the Three Deuces was a musician's paradise and location of nightly jam sessions among Joe Sullivan, Tough, Condon. Bud Freeman and Frank Teschmaker. One evening Benny Good- man dropped by the club and first saw Krupa, then 19, jamming with the group. In 1928. Krupa recorded with the Three Deuces musicians. Under the label of Red McKenzie and Condon's Chicagoans, "Nobody’s Sweetheart" was recorded With the same group, under the name Chicago Rhythm Kings, they recorded, "There'll Be Some Changes Made," "Changes." and "I've Found a New Baby." everytime we got something new to do, I'd pass my part to Glenn who'd hum it for me a few times until I got it in my head and then I'd play it. "There must have been 40 men in the band and I'd be drumming away with all my might when Red would signal me to give. I just didn't have the technique to control the drums without killing myself. I was a jazz drummer, not a musician. I used all the Chicago beats, four with one hand and a light press with the other on the second and fourth beats, hand to hand rolls accented and a lot of woodblock rhythms. So, right then and there 1 resolved to learn the drums technically, from the bottom up. I got myself the best teacher in New York and started in. I used to practice seven and eight hours per day. At the same time, I'd go up to Harlem after the job and watch tap dancers and great drummers like George Stafford and Sonny Greer. I learned a lot of rhythmic beats that way." During the run of Strike Up the Band, Gene recorded, "Rockin Chair," and "Barnacle Bill" with Hoagv Carmichael. Carmichael's sidemen included: the Dorsey Brothers, the Goodman Brothers, Bud Freeman, Joe Venuti, Eddie Lang and Bix Beiderbecke. With the end of the show, Gene played his last date with Red Nichols in Gershwin's Girl Crazy. By 1931, he joined Irving Aaronson and His Com- manders and after a year, toured with Russ Columbo's band. Benny Goodman organized the band for Columbo and they spent a summer at Woodmansten Inn. Goodman and Krupa eventually parted and it was not until 1934. while playing at the Music Hall Restaurant, that Goodman, now with his own band, decided to assemble the top musicians and tour Europe. The band personnel included Wilson and Krupa The tour, however, never happened but Krupa became a member of the Goodman Orchestra. From 1935-1937, Goodman's fame escalated, as did Krupa's. Goodman wanted a drummer who could "swing" and felt that only Krupa could meet his standards. Of Krupa, Goodman said, "From the time he joined us, Gone gave the band a solidity and firmness as far as rhythm was concerned, that it never had before." According to Krupa, on working with Goodman, "I worked with (Buddy) Rogers one year and then I joined Benny Goodman. That was the greatest thrill of my life, an opportunity to play straight from the heart jazz with a full band of top-notchers. I took the band as seriously as Benny did and worried all the time about each new man and how we were going over. "Or course, Benny had a tough time get- ting started. I remember when we were playing Elitch's Gardens in Denver that we never had more than five people on the floor and it was very discouraging. One night, Benny laid out a lot of rhumbas and stocks. 'What's up Benny,' I said. Benny shook his head. 'I guess this jazz idea of ours is no good. I'm going to get people to dance if I have to play all the mouse music ever written.' "I shook my head right back. 'Look Benny, I'm making $85 a week with you and if you're going commercial I might as well go back to Buddy Rogers and make $125 a week. Let's stick to your original idea even if we go under.' "Benny did and a week later at the Palomar in Los Angeles, we clicked -- for good"
Though Krupa became established with Goodman's Orchestra. it was the fame of the Benny Goodman trio and quartet that had much to do with Krupa's rise in the music world. It all began at a party in the home of jazz singer Mildred Bailey. Teddy Wilson at the piano to provide some music for the guests. Goodman followed Wilson's lead and took out his clarinet. A cousin of Bailey's had set up his drums in the living room. Krupa sat behind the drums and the three began to jam. The idea of the Benny Goodman trio was born. Several days later, Goodman arranged a recording date with Wilson and Gene. Such memorable cuts as "Body and Soul," "After You've Gone" and "Someday Sweetheart" were recorded. Though Krupa was perfect for the Goodman Orchestra, problems developed. It was rumored that Krupa's technique and showmanship drew attention away from the orchestra, particularly Goodman, and that their relationship suffered because of it. But Krupa tried to dispel those rumors in an interview with Ken Alden shortly after his exit from the band. "All my life I've wanted my own band. I've sweated and saved for it. Leaving Benny had to happen. It was never a case of not getting along with Benny. Let me tell you he's a swell guy and a wonderful musician. You see, Benny used to let me lead the band when he got off the stand. I was sort of concert master of the outfit I got to like the feel of it. And I wanted more." "About 4,000 neighborhood and visiting vantage in the Marine Ballroom of Atlantic City's Steel Pier on Saturday. April 16 and then. once perched on their pet posts. proceeded to welcome with most exhuberant howls and huzzahs the first public appearance of drummer man Gene Krupa and his newly formed jazz band. The way the felonic herd received, reacted to and withstood the powerful onslaughts of Krupa's quadruple "f" musical attacks left little doubt that Gone is now firmly entrenched at the helm of a swing outfit that’s bound to be recognized very shortly as one of the most potent bits of catnip to be fed to the purring public that generally passes as America's swing contingent… Throughout the evening the kids and kittens shagged, trucked, jumped up and down and down and up, and often yelled and screamed at the series of solid killer-dillers." 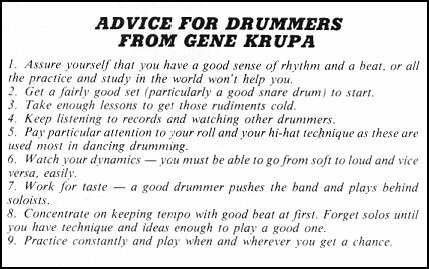 George Simon's review of the Gene Krupa band debut exudes the same amount of enthusiasm as Krupa's style of swing caused. At the height of its tremendous popularity, the band featured trumpter Roy Eldridge and lead vocalist Anita O'Day. Of O'Day, George Simon said: "Her rhythmic, gutty, illegitimate stylee first confused but soon converted many listeners. Whereas most band girl singers had projected a very feminine or at least cute girl image, Anita came across as a hip jazz musician. She would dress in a suit similar to those of the musicians, and when she'd sing she'd come on strong, full of fire, with an either-you-like-me-or- you-don't-but if-you-don't it’s-your-loss attitude." Krupa had his eye on Eldridge for a long time and, when Eldridge finally consented to join the band, Krupa was ecstatic. Some of Krupa's most successful recordings were made during this period, such as "Georgia On My Mind," "Green Eyes" "Thanks For the Boogie Ride." and "Let Me Off Uptown." Though the relationship between Krupa and Eldridge was affable, the same could not be said for O'Day and Eldridge. For undisclosed reasons, they did not get along and the riff resulted in O'Day's exit from the band. Finding a replacement for O'Day was a problem and several male vocalists were shuffled in and out of that spot, the most successful being Johnny Desmond. Ray Eberle and Howard Dulaney also performed briefly with the band. Krupa was forced to leave his band in 1943, a result of his arrest for possession of marijuana. Though the charges were eventually dropped, Krupa served 84 days in jail. Upon his release, Krupa re-joined the Benny Goodman Orchestra for several weeks. The experience was personally tragic and yet it did not seem to taint his career in any way. The public still loved Krupa and in 1944, he regained his title as the most outstanding drummer in the United States. In that same year, he toured with the Tommy Dorsey Orchestra for 6 months, gaining the confidence to form another band, a big-band like Dorsey's with full string section. The new band was not what Krupa's fans expected. Used to the "swinging" quality that made audiences love the "King of the Hidebeaters" a new Gene was being offered to them. Krupa set himself in the role of bandleader, seldom playing the drums. When he did play, Krupa’s perfor- mances were full of flash, cramming as much technical prowess into his playing as to become a disadvantage The new band was even less of a hit with music critics. In his July 5, 1947 review For Melody Maker, Gerald Pratley said: "The band, and Krupa, seemed noisy and without discipline. It created no atmosphere, and to me there was neither excitement nor inspiration in his performance." Eventually, Krupa switched back to the kind of swinging music that made him famous - recording "Leave Us Leap" and "What’s This?" In 1951, Krupa became affiliated with the Jazz At The Philharmonic troupe for three years and led several trios and quartets. the first quartet with Charlie Ventura and Eddie Shu. Another successful venture of Krupa's was the drum school that he and drummer Cozy Cole opened in 1954 In two years, the school averaged 135 to 150 students per week. "It's getting to be that guys are concentrating too much on what not to play instead of what to play… I always try to produce some sort of sound that will blend with what’s going on. For example, there are a lot of different timbres you can get from just one cymbal. Sometimes, I'll play it lighly with the tip of the stick and let it really ring. At other times, a choked sound with no overtones fits better, so I'll hit the cymbal rather hard and let the stick stay on it a little longer to kill the ringing. The same goes for the drums themselves. Many drummers don't know how to tune their snares and bass drums right. And they just forget about them and lay on that cymbal." "To me a drum solo must have substance and quality. Each one is something in itself. Before I begin, I try to have a good idea of what I’m going to play. And while I'm playing, I'll hum some sort of thing to myself. Even if it's only in raw form such as boom-did-dee, boom did-dee, boom-did-dee, boom, and then follow that with a rhythmic sound (which I try to hear inside of me before I play it) that will round out the phrase. Each syllable that 1 hum to myself is not only a separate beat, but also a separate sound." "The point is that all the time while I'm playing, I hear the tune and try to relate what I'm playing to it. I guess I'm like any jazz musician who thinks as well as feels. That's what we're supposed to do, isn't it." Krupa decided in 1967 to retire, explaining, "I felt too lousy to play and was sure I sounded lousy." But the lure of the stage, audiences and the music brought him back three years later. He appeared with Benny Goodman, Lionel Hampton and Teddy Wilson several times, their most memorable performance being opening night at the 1973 Newport Jazz Festival at Carnegie Hall.